Experts will tell you, the best material for planter boxes, be it window planters for your deck or tree planters for your garden, will always be teak due to its natural resistance to water damage. 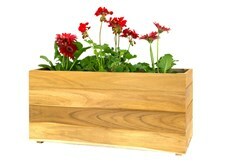 These teak planters come in a wide variety of dimensions to suit every possible need. 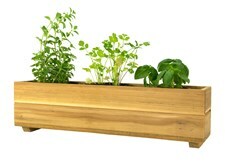 We stock herb planters, window / flower boxes, as well as tree planters. These planters have been fully assembled using a tongue and groove joinery making these teak planter boxes not only practical and functional, but also extremely durable. All of our teak planters come with their appropriate drain holes. 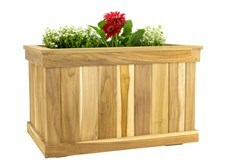 Browse this section today to fulfill your planter box needs. 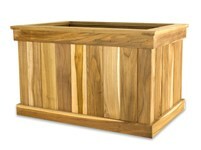 These beautiful garden planter boxes from Teak Planter are crafted from solid teak grown from seed in democratic Costa Rica. 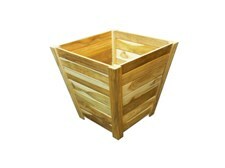 These versatile planters offer terrific value and are designed not to require liners. All hardware is stainless steel. For your convenience, these teak planters include holes in the base as well as teak footings to provide for drainage in outdoor settings, however, these planters are also great for use as a storage or toy box. 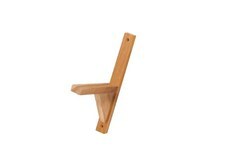 In order to ensure a source of consistently superior teak wood that is also environmentally-friendly, Everything Teak develops and maintains their own teak plantations. Many years ago, they planted hundreds of thousands of trees in Costa Rica in an effort to reforest areas of the country that had been completely denuded of forest. The trees are tended with great expertise and care, and in a process spanning decades, they produce some of the finest teak wood in the world. And it is from these quality raw materials that our teak planters and furniture are made. All of their plantations are managed in a sustainable, environmentally sound way to ensure the permanent preservation of at least a small part of the ever-shrinking tropical Rain forest. Our Teak Tree Planter Boxes are built with 3/8" thick by 3" wide teak wood for the sides, and one inch teak wood for the bottoms.